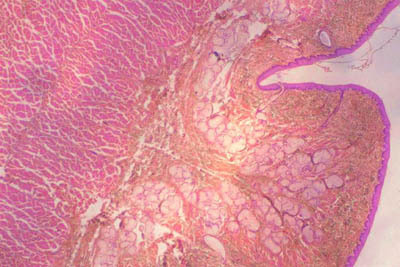 On histology slide (1), three of the four layers of the esophagus are visible: mucosa, submucsa, and muscularis externa. The stratified squamous epithelium of the mucosa is visible. Notice the esophageal glands in the submucosa. The adventitia is not visible on these slides. Histology hint from Sarah Bellham: In histology slide (2), notice that nuclei go to the very top layer on the epithelium.